ដើមឈើខ្នុរជាដំនំាមានដំាទូទៅក្នុងតំបន់ត្រូពិចនៃប្រទេស[[ឥណ្ឌា|ឥណ្ឌា, បង់ក្លាដែស, នែរប៉ាល់, សេរីល័ង្កា, វៀតណាម, ថៃ, ម៉ាឡេស៊ី, ឥណ្ឌូនេស៊ី, និងប្រទេស ភីលីពីន]]. ផ្លែខ្នុរក៏អាចរកឃើញនៅក្នុងអាហ្វ្រិចខាងកើត, ឧ., ក្នុងប្រទេសUganda, Tanzania, and Mauritius, គ្រប់កន្លែងក្នុង ប្រទេសប្រេស៊ីល និង ប្រជាជាតិតំបន់ការាអិព ដូចជាចាម៉ែកា(Jamaica). Jackfruits growing on the Trunk. ពាក្យ‹‹ខ្នុរ››មកពី ភាសាព័រទុយហ្គាល Jaca , ពេលខ្លះគេថាបានមកពីពាក្យក្នុងភាសាម៉ាឡាយ៉ាឡំា, chakka (ម៉ាលេយ៉ាឡំា Chakka pazham : ചക്ക, តាមីល pila-pazham). ពេល ជនជាតិព័រទុយហ្គាលមកដល់ប្រទេសឥណ្ឌានៅKozhikode (Calicut) លើ ឆ្នេរម៉ាឡាបា (Kerala) ក្នុងឆ្នំា 1498, ម៉ាឡាយ៉ាឡំាឈ្មោះ chakka បានកត់ត្រាទុកដោយ Hendrik van Rheede (1678–1703) ក្នុង Hortus Malabaricus , ច្បាប់ iii ជា ឡាទីន. Henry Yule បានបកប្រែសៀវភៅរបស់ Jordanus Catalani (f. 1321–1330) Mirabilia descripta: ភាពអស្ចារ្យនៃភាគខាងកើត . ឈ្មោះជាភាសាអង់គ្លេសថា "jackfruit" ត្រូវបានប្រើដោយរូបវិទូ និង ធម្មជាតិវិទូឈ្មោះ Garcia de Orta ក្នុងសៀវភៅរបស់គាត់នៃឆ្នំា1563 Colóquios dos simples e drogas da India . ច្រើនសតវត្សកន្លងមក, អ្នករុក្ខសាស្រ្តឈ្មោះRalph Randles Stewart ប្រាប់ថាវាជាឈ្មោះមកពីវាល៍លៀមជែគ (1795–1822), ជាអ្នករុក្ខសាស្រ្តជនជាតិស្កត់ឡែនម្នាក់ ដែលធ្លាប់ធ្វើការអោយក្រុមហ៊ុន ឥណ្ឌាខាងកើតក្នុង បេងហ្គាល ស៊ូម៉ាត្រា និង ម៉ាឡេស៊ី។ នេះជាអ្វី ដែលប្រឌិតឡើង ដូចផ្លែហៅថា "ជែគ" ជាភាសាអង់គ្លេសមុនពេលវាល៍លៀមជែគកើត៖ ឧទាហរណ៍ដូចជា ក្នុងសៀវភៅរបស់Dampierឆ្នំា 1699, A New Voyage Round the World . គេហៅថា "panasa" នៃ Telugu. ជា Marathi គេហៅថា "phanas". In other areas, the jackfruit is considered an invasive species as in Brazil's Tijuca Forest National Park in Rio de Janeiro. The Tijuca is mostly an artificial secondary forest, whose planting began during the mid-19th century, and jackfruit trees have been a part of the park's flora since its founding. Recently, the species expanded excessively because its fruits, once they had naturally fallen to the ground and opened, were eagerly eaten by small mammals such as the common marmoset and coati. The seeds are dispersed by these animals, which allows the jackfruit to compete for space with native tree species. Additionally, as the marmoset and coati also prey opportunistically on bird's eggs and nestlings, the supply of jackfruit as a ready source of food has allowed them to expand their populations, to the detriment of the local bird populations. Between 2002 and 2007, 55,662 jackfruit saplings were destroyed in the Tijuca Forest area in a deliberate culling effort by the park's management. Jackfruit are known for having a distinct aroma. In a study using five jackfruit cultivars, the main jackfruit volatile compounds that were detected are: ethyl isovalerate, 3-methylbutyl acetate, 1-butanol, propyl isovalerate, isobutyl isovalerate, 2-methylbutanol, and butyl isovalerate. These compounds were consistently present in all the five cultivars studied, suggesting that these esters and alcohols contributed to the sweet and fruity aroma of jackfruit. The flesh of the jackfruit is starchy and fibrous, and is a source of dietary fibre. The flavor is comparable to a combination of apple, pineapple and banana. Varieties are distinguished according to the characteristics of the fruits' flesh. In Brazil, three varieties are recognized. These are: jaca-dura , or "hard" variety, which has firm flesh and the largest fruits that can weigh between 15 and 40 kilograms each; jaca-mole , or "soft" variety, which bears smaller fruits, with softer and sweeter flesh; and jaca-manteiga , or "butter" variety, which bears sweet fruits, whose flesh has a consistency intermediate between the "hard" and "soft" varieties. In West Bengal there are also two varieties - khaja kathal & moja kathal. The kajha kathal has slightly hard flesh when ripe while the moja kathal is very soft. The fruits are either eaten straight or as a side to rice / roti / chira / muri. Sometimes the juice is extacted and either drunk straight or as a side with muri. The extract is sometimes condensed into rubber like delectables and had as candies. The seeds are either boiled or roasted and eaten with salt and hot chillies. They are also used to make spicy side-dishes with rice or roti. In Karnataka it is called as "Halasu". In Mangalore, Karnataka, the varieties are called bakke and imba . 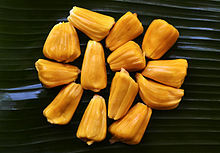 The pulp of the imba jackfruit is ground and made into a paste, then spread over a mat and allowed to dry in the sun to create a natural chewy candy. The young fruit is called polos in Sri Lanka and idichakka or idianchakka in Kerala: those having firmer, sweeter fruit are called varikka chakka ; those having lesser firmness and sweetness are called koozha chakka. Jackfruit is commonly used in South and Southeast Asian cuisines. It can be eaten raw when ripe, but as the raw unripe fruit is considered inedible, it is best cooked. Ripe jackfruit is naturally sweet with subtle flavoring. It can be used to make a variety of dishes, including custards, cakes, halo-halo and more. In India, when the Jackfruit is in season, an ice cream chain store called "Naturals" carries Jackfruit flavored ice cream. Ripe jackfruit arils are sometimes seeded, fried or freeze-dried and sold as jackfruit chips. The seeds from ripe fruits are edible, are said to have a milky, sweet taste, and may be boiled, baked or roasted. When roasted the flavor of the seeds is comparable to chestnuts. For making the traditional breakfast dish in southern India: idlis, the seeds are used as an ingredient and jackfruit leaves are used as a wrapping for steaming. Jackfruit dosas can be prepared by grinding jackfruit flesh along with the batter. The cuisines of India, Nepal, Bangladesh, Sri Lanka, Indonesia, Cambodia, Thailand and Vietnam use cooked young jackfruit. In Indonesia, young jackfruit is cooked with coconut milk as gudeg . In many cultures, jackfruit is boiled and used in curries as a staple food. In northern Thailand, the boiled young jackfruit is used in the Thai salad called tam kanun . In West Bengal the unripe green jackfruit called "aechor" is used as a vegetable to make various spicy curries, side-dishes and as fillings for cutlets & chops. It is especially sought after by vegetarians who substitute this for meat and hence is nicknamed as gacch-patha (tree-mutton). In the Philippines, it is cooked with coconut milk (ginataang langka ). In Réunion Island, it is cooked either alone or with animal flesh, such as shrimp or smoked pork. Because unripe jackfruit has a meat-like taste, it is used in curry dishes with spices, in Sri Lankan, Andhran, eastern-Indian (Bengali), and Keralan cuisine. The skin of unripe jackfruit must be peeled first, then the remaining whole jackfruit can be chopped into edible portions and cooked before serving. Young jackfruit has a mild flavor and distinctive meat-like texture and is compared to poultry. Meatless sandwiches have been suggested and are popular with both vegetarian and nonvegetarian populations. Percentages are relative to US recommendations for adults. The edible jackfruit is made of soft, easily-digestible flesh (bulbs); when eaten, its simple sugars like glucose and fructose can quickly replenish one's energy and bring on a physical sense of euphoria and revitalization. A portion of 100 g of edible raw jackfruit provides about 95 calories and is a good source of the antioxidant vitamin C, providing about 13.7 mg.  Jackfruit seeds are rich in protein. Fresh jackfruit has small amounts of vitamin-A, flavonoid pigments such as carotene-ß, xanthin, lutein and cryptoxanthin-ß. Together, these compounds play vital roles in antioxidant and vision functions. Vitamin A is also required for maintaining integrity of mucus membranes and skin. Consumption of natural fruits rich in vitamin-A, and carotenes has been found to protect from lung and oral cavity cancers. Jackfruit is rich in B-complex vitamins, with large amounts of vitamin B-6 (pyridoxine), niacin, riboflavin, and folate. Fresh jackfruit provides potassium, magnesium, manganese, and iron. Potassium provides cell and body fluids that help regulate heart rate and blood pressure. Jackfruit can be a good bulk laxative because of its dietary fiber which helps to protect mucous membranes in the colon by decreasing exposure time and binding to cancer-causing chemicals. In general, the seeds are gathered from the ripe fruit, sun-dried, then stored for use in rainy season in many parts of South Indian states. They are extracted from fully matured fruits are washed in water to remove the slimy part. Seeds should be stored immediately in closed polythene bags for one or two days to avoid them from drying out. Germination is improved by soaking seeds in clean water for 24 hours. During transplanting, sow seeds in line with 30 cm apart in a nursery bed filled with 70% soil mixed with 30% organic matter. The seedbed should be shaded partially from direct sunlight in order to protect emerging seedlings. The wood of the tree is used for the production of musical instruments. In Indonesia, hardwood from the trunk is carved out to form the barrels of drums used in the gamelan , and in the Philippines, its soft wood is made into the hull of a kutiyapi , a type of Philippine boat lute. It is also used to make the body of the Indian string instrument veena and the drums mridangam and kanjira ; the golden yellow-coloured timber with good grains is used for building furniture and house construction in India. The ornate wooden plank called avani palaka made of the wood of jackfruit tree is used as the priest's seat during Hindu ceremonies in Kerala. In Vietnam, jackfruit wood is prized for the making of Buddhist statuaries in temples. Jackfruit wood is widely used in the manufacture of furniture, doors and windows, and in roof construction. The heartwood is used by Buddhist forest monastics in Southeast Asia as a dye, giving the robes of the monks in those traditions their distinctive light-brown color. Outside of its countries of origin, fresh jackfruit can be found at Asian food markets, especially in the Philippines. It is also extensively cultivated in the Brazilian coastal region, where it is sold in local markets. It is available canned in sugar syrup, or frozen. Dried jackfruit chips are produced by various manufacturers. In northern Australia, particularly in Darwin, jackfruit can be found at outdoor produce markets during the dry season. Outside of countries where it is grown, jackfruit can be obtained year-round both canned or dried. It has a ripening season in Asia of late spring to late summer. The marketing of jackfruit involved three groups: producers, traders (middlemen) including wholesalers, and retailers. The marketing channels are rather complex. Large farmers sell immature fruits to wholesalers of which could help cash flow and reduces risk, whereas medium sized farmers sell fruits directly to local markets or retailers. The jackfruit is one of the three auspicious fruits of Tamil Nadu, along with the mango and banana, known as the mukkani (முக்கனி). These are referred to as ma-pala-vaazhai (mango-jack-banana). The three fruits (mukkani ) are also related to the three arts of Tamil (mu-Tamizh ). Jackfruit is the national fruit of Bangladesh. ↑ T. Pradeepkumar; B. Suma Jyothibhaskar, K. N. Satheesan (2008)។ Prof. K. V. Peter។ រៀ.។ Management of Horticultural Crops, Vol.11។ New Delhi, India: Sumit Pal Jain for New India Publishing Agency។ ទំ. 81។ ល.ស.ប.អ. (10) 81-89422-49-9។ http://books.google.com/books?id=UuCWMJjOvYUC&pg=PA81&dq=jackfruit+Chakka#v=onepage&q=jackfruit%20Chakka&f=false។ "The English name jackfruit is derived from Portuguese jaca, which is derived from Malayalam chakka." ↑ Anon. (2000) The American Heritage Dictionary of the English Language: Fourth Edition. ↑ Jackfruit. Hort.purdue.edu. Retrieved on 2011-10-17.